Let's help eliminate Quran illiteracy one child at a time! One of the goals of Nadi Furqan is to help every child and adult to be able to recite the Quran well and at the same time understand the sciences behind the Quran reading. 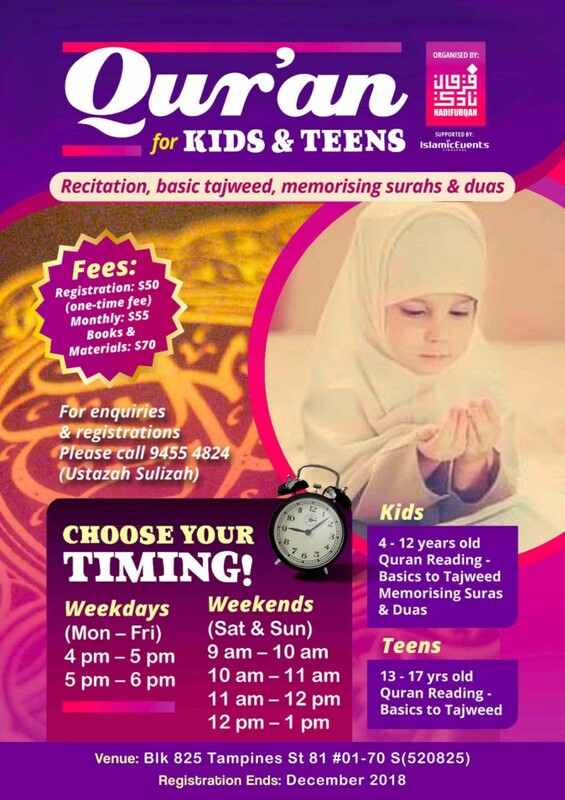 Are you looking for a Quran centre to send your Kids or Teens for Quran Reading? Kids - 4 to 12 years old. Teens - 13 years to 17 years old. Options of Reading Once a Week or Twice a Week. Depending on the level that your child is in, they will be assessed by our Asatizahs and recommended to start at the different levels. So what are the different levels? A new beginner? No idea what is huruf hijaiyah and how to pronounce it. You child have studied reading the Quran but have not covered Tajweed? By now your child should already know where the different huruf comes from which part of the mouth, throat, etc as Tajweed requires them to know the different groups. Your child know the basic letters, pronunciation and basic tajweed. Time to go deeper into the science. Every time they read the Quran, they understand why they have to read in such manner. At level 3, they will be drilled to read over and over until they can remember the rules of tajweed in their heart. This is important for so that they can be fluent in reading. They will also bring their own Quran at this level. i) 1hr per session, once a week. ii) One time registration fee of $50. Monthly fee $50. ii) $70 books and materials. iii) At each level, you are required to purchased books and notes: $50 for each level. Depending on the level your child is at. So how do I sign up? Please read everything thoroughly. Use our registrations system below. Step 1: Change item Qty to 1. If you miss the payment step, check your email for the registration and payment link. Once registration and deposit is made, Nadi Furqan staff will contact you to arrange the 1st session as soon as possible. Q1. During the first session, can I re-arrange the schedule that I have first registered for my child? A1. Yes you can. Just share with the Quran teacher the schedule and make personal arrangements with them. Q2. How much money do I need to bring on the first session? A2. Bring the minimum of $50 for the first month and $70 for the book and materials. Q3. I have made the deposits and my child did not turn up on the appointed date due to many reasons - reschuffle dates, etc. A3. Every time there is a "no-show", the centre is still required to pay the asatizah that showed up for your child. Please be responsible when you arrange the appointment date. The deposits given will be forfeited. Q4. Do you offer Home based Quran? A4. We don't offer these services as we need to ensure that Asatizahs teach the same methodology through out the different levels. So we are not able to offer the Home based Quran. Through this program, we hope your child and teen will be able to read the Quran well and insyallah and when we are no longer in this world someday they are able to make dua for you and read the Quran. If Allah swt permits, they too can become Quran teachers and passed the knowledge down to their children.